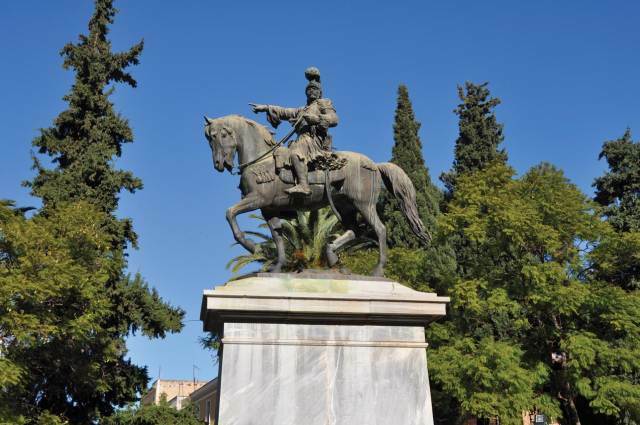 The park of the old train station is dominated by the bronze statue of the hero of the Greek Revolution, Lieutenant Theodore Kolokotronis, also known as ‘The Old Man of Moria’. This impressive statue is the work of the sculptor Lazaros Sohos of Tinos. Surrounded by four identical cannons, it portrays the leader of the struggle for freedom on horseback, showing the other chieftains the way to Tripoli, as the most suitable place in the final conflict with the Turks. A copy of this statue can be found in Klafthmonos Square in Athens.